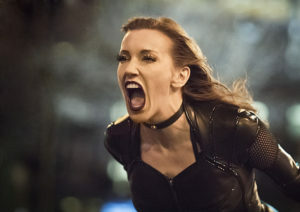 Katie Cassidy‘s Laurel Lance character, also known as the Black Canary, was killed on Arrow earlier this season… lucky for us, Laurel is still alive on Earth-2, and she’s guest starring on The Flash. Her episode – the next to last one of Season 2 – is called “Invincible,” and on Earth-2 her alias is “Black Siren.” You can read an official description of the episode here. Look for “Invincible” on May 17. 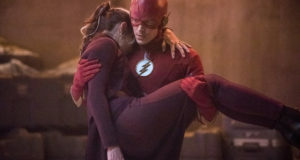 The CW has now released a bunch of photos from the episode, and you find those below, so, enjoy! It looks like we’re getting some Reverb and Killer Frost flashback action too…. unless, of course, our Cisco and Caitlin are in disguise! 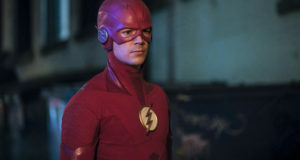 Next: Flash “Invincible” Extended Promo Screencaps – With New Clips!